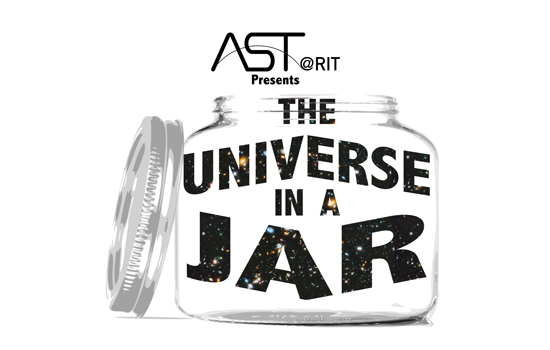 Satisfy your cosmic curiosity and experience “The Universe in a Jar” at Imagine RIT. Graduate students in RIT’s astrophysical sciences and technology program will distill the mysteries of the universe for visitors to the Imagine RIT: Innovation and Creativity Festival on May 7. Their exhibit, “The Universe in a Jar,” is no magic trick: Table-top models and common items, such as marbles and candy used to represent different types of stars, will illustrate astrophysical concepts, proportions and statistics, giving festival-goers a primer in basic astronomy. A working telescope with a special filter that blocks 99.999 percent of the sun’s light will make it safe for visitors to observe our closest star, weather permitting, said Kristina Punzi, exhibit coordinator and a fourth-year Ph.D. student in the astrophysical sciences and technology program. “You should never look directly at the sun because you can damage your eyes,” she warned. Visitors to the large exhibit, located outside of Gosnell Hall, near the greenhouses, will sample the spectrum of astronomy research at RIT through hands-on activities, a game of Astro Trivia, and models of popular telescopes like the Hubble Space Telescope, Spitzer Space Telescope, Chandra X-ray Observatory and the Atacama Large Millimeter Array. Students and faculty will be on hand to talk about the sun, gravitational waves, different types of stars and galaxies in the universe, including galaxies with extremely bright central regions, or nuclei, called active galactic nuclei. “We aim to inform the community, in an accessible way, about the state-of-the-art astronomy research being done at RIT,” said Punzi, who is originally from Ronkonkoma, N.Y.
She is coordinating the exhibit for a second year in a row. Her team of nearly 25 astronomers includes graduate students and faculty members from RIT’s School of Physics and Astronomy, the Chester F. Carlson Center for Imaging Science and the School of Mathematical Sciences.